Will Trump Direct FEMA to Fund Churches Hit by Hurricanes? In addition to devastating cities, harbors, and oil refineries, Hurricane Harvey also barreled directly into a cluster of decades-old toxic-waste sites. The US Environmental Protection Agency has confirmed that 13 of the 41 Superfund sites in the region hit by Harvey—areas designated the most toxic in the country—were flooded in the storm. Some of these sites contain toxic sludge, in many cases left by the region’s petrochemical industry. Even after a site is granted Superfund status, which designates it a priority for the federal government, cleanup can take decades—and even then the effort is rarely able to eliminate all toxins. The EPA can only say for certain that two of the 13 sites don’t require emergency cleanup, and officials say they haven’t been able to access the 11 other sites to check for leaks. “Teams are in place to investigate possible damage to these sites as soon flood waters recede, and personnel are able to safely access the sites,” the EPA said in a statement Saturday. Harris County, which includes Houston, has the most Superfund sites of any county in Texas. While the EPA says the sites have been inaccessible, the Associated Press managed to visit seven Houston-area Superfund sites by foot and by boat last week, finding all of them inundated by a “murky soup” of churning floodwater, in some cases several feet deep. The EPA declined to indicate to the AP why federal employees weren’t able to do the same. “Despite reporting from the comfort of Washington, [AP reporter Michael] Biesecker had the audacity to imply that agencies aren’t being responsive to the devastating effects of Hurricane Harvey,” the EPA read. The statement neglected to mention the other reporter listed as an author on the story, Jason Dearen, from the ground in Texas. “Once again, in an attempt to mislead Americans, the Associated Press is cherry-picking facts,” the EPA statement continued. 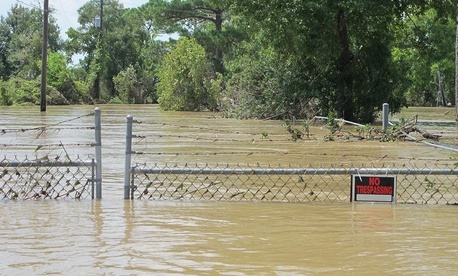 Toxicologists were concerned as people waded through the flood waters near Texas Superfund sites. One scientist watched as retention ponds located up road from the Brio Refinery Superfund site turned into swimming holes. Ethylbenzene, chlorinated hydrocarbons, and other chemical compounds were once pooled in pits at the site. “Yesterday as these large retention ponds filled up, eight feet deep in places, kids were swimming in them, and that’s not good,” Wes Highfield, a scientist at Texas A&M University-Galveston, told the Washington Post.